This is a great tip Sally. It would seem to be kind of obvious - but so many people don't follow. Good advice, Sally, but it's amazing how often I hear contest organsiers complaining that people do not read (or follow) the guidelines. My tip for apsiring contestants is to enter writing contests which have some sort of feedback. In this contest's case, the entry fee is well worth it because you are proving feedback to every entrant. For many contests, there is no feedback at all, except perhaps publication of the winners' names. Even just a judges' report of a general nature (ie comments about all entries rather than individual feedback) can be helpful. So, when entering a contest, have a look at what sort of feedback will be available to entrants. What a great site, lots of informative info. I loved the photo, it is always nice to match the face with who you speak to on the phone. Thanks for the tips! could you re-fresh my memory as to when the competition closes? Thanks, folks, for the comments and the input. 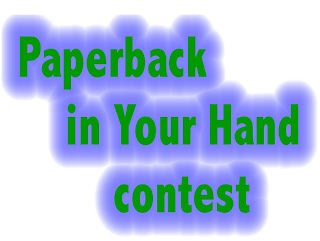 The closing date for the first Paperback in Your Hand Contest is the last day of March, 2009. If this first contest is successful (ie if we get enough entries of good standard), there will be a second contest running from April 1st to June 30th.